It is my sincere goal that this book be an instrument for healing. 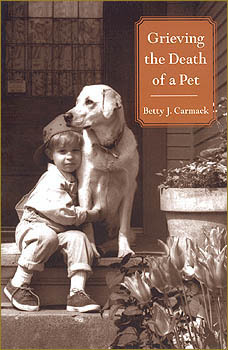 It marks the twentieth anniversary of my having worked as a nurse in pet loss counseling. Throughout these years I've had the privilege of walking the path with over 2,000 people who were anticipating or experiencing grief for the death and loss of their animal companions. It's been an honor and gift to be invited on these journeys of grief. These are exceedingly private and personal times, and to be asked to share in these moments is a trust which I honor and respect. My book puts a face on the lived experience of loss and gives it a voice. It clearly says that grief from a loved animal's death does matter and it matters profoundly.